We are all familiar with the outcry over the loss of the Start Menu and the Metro Interface that (a) did not always make sense and (b) made us use a Start screen in order to use our Desktop applications. Then, too, games, Explorer and other applications in Metro only worked full screen. That is often a bad idea, and many users rejected this as well. If this describes how you feel about using Windows 8, please keep reading on below to see some of the things I have done to make Windows 8 work to my benefit instead of the way Microsoft would like me to work. First, you need to be sure you have upgraded to Windows 8.1. Now Windows 8.1 is a different operating system than Windows 8 – it is not a service pack upgrade. The upgrade may go smoothly and it may not. So if you are running Windows 8.1 already, great. If not, be sure to back up your computer first in case you have to start all over again. If you do have to, or choose to, start over, install Windows 8, update all your drivers, and then go to Windows 8.1 (use the Microsoft Store) before installing any applications. Second, it is important (in my opinion and from my own experience) to have the newest drivers for your machine, and the newest versions of all the software that you own. I use Office 2013 and that works fine on Windows 8 and Windows 8.1. I had to upgrade Symantec Endpoint Protection to a very new version to work in Windows 8.1. Raxco Perfect Disk had to be upgraded and I had to purchase an upgrade to NCP Secure Entry for VPN connections. Long story short – everything is new on my Windows 8.1 machine and it works smoothly as a result. With respect to Desktop operations on a computer (not a tablet or phone), I disliked using Metro to access things and, in fact, I rarely use Metro at all anymore. There are some things you can to do improve the situation. First, Windows 8.1, you can get Windows to start directly in the Desktop. Right click on the Taskbar and select Properties to see the Taskbar and Navigation properties screen. Click on the Navigation tab and then check off (select) the first three options in the Start Screen setup. Apply, close out and restart your computer and you will land directly in the desktop. See the screenshot directly below here. Second, I appreciate having all my applications readily available to me. There are add-on programs like ViStart and Classic Shell that allow you to have a Start Menu similar to Windows 7. However, I like the Windows 8 built-in tools, and made a Start Menu on the right side Taskbar as a new Toolbar called Programs. Here is how you do it. Now, when the computer is running, click on Programs and all your applications will show up. New applications will be added automatically. You can right click on a blank space in the menu when it comes up and select Sort by Name. This is very handy. I also added my most used programs as Icons on the Desktop. The result is that I can work all day and never use Metro to do anything. With these modifications (no purchased software), I got Windows 8.1 working smoothly and, in many ways, just like Windows 7 (which I had used for about 3 years). I purchased Office 365 / 2013 by subscription and I have adapted to that. I made sure my Nokia CS-18 USB Internet key worked and I added a VPN feature to it (small monthly cost) to permit NCP Secure Entry VPN access to clients when using the Nokia USB key. I installed VMware Workstation V10 so I can run Virtual Machines (Windows 7 Pro, Vista Business and back all the way to Windows 95 and DOS 6.3). I did all of this on a 3 pound ThinkPad X230 with an i5 CPU with 4 cores, 8 Gb of memory and a 500 Gb 7200-rpm hard drive. This makes an excellent machine to carry to clients and is a complete test bench in addition. Most other applications (Adobe Standard, WinZip and all my technical applications) work normally. In terms of security, I use Symantec Endpoint Protection V12.1.5. This is my personal choice because it uses very little CPU resource and protects very well. You may have a different Anti-Virus application choice and that is fine. You will want to make certain, however, that it works properly in Windows 8.1. Whatever you use and whatever you think, ALL anti-virus applications are rearguard applications that determine how to protect AFTER the malware is out in the open. Recently, the technical folk at Microsoft brought out EMET (Enhanced Mitigation Experience Toolkit) and I have installed and use EMET. I am using V5 right now. EMET is a zero day mitigation tool that works by obfuscating addresses that hacker know about and use. 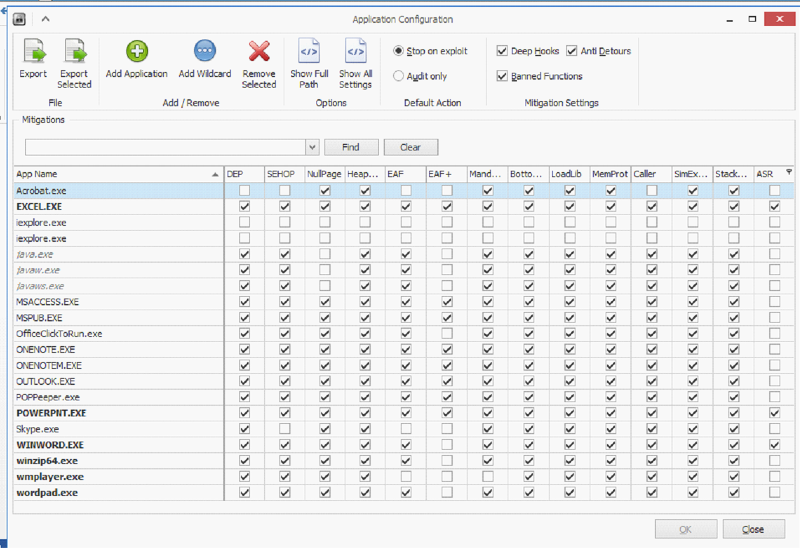 EMET is technical and if you wish to try it, you will need to read about it first. Some programs (notably Adobe and Internet Explorer) “stop working” if you attempt to apply all mitigations. As I note, this tool is technical, however, it is very effective and I do recommend it. Just be ready for some experimentation and breakage until you get it right. I have shown a screen below of the mitigations I use currently. I use Wireless Access (Wi-Fi) a lot in my travels. Way back in my Vista days, I found Wi-Fi would stop working and I would have to restart the computer to get Wi-Fi back. After some investigation, I realized that power management was turning off the card. So if you have Wi-Fi, there are things you can do to ensure it is always on. Go to Device Manager and to the Properties of the Wireless Card. In the Power Management tab, make sure you uncheck the box “Allow the computer to turn off this device to save power”.While you are here, do this for Bluetooth as well. Go to Control Pane, Power Options, change your plan settings, change advanced power settings, and go down to Wireless Adapter settings. Change all occurrences of Maximum Savings to Maximum Performance. If you have a third party wireless manager (not common in Windows 8) check power management there as well. This had to be done Access Connections for Windows 7 and below. 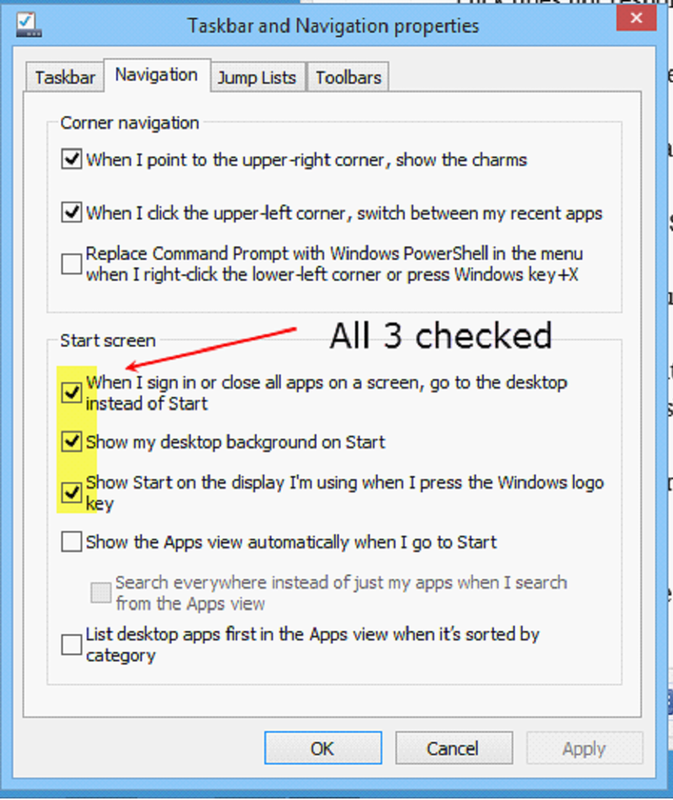 Also, as it turns out, Window 8 removed GUI management of Wireless Profiles. However, it is reasonably easy to manage the profiles by command line. Command Prompt: netsh wlan delete profile name="Profile Name"
These are a number of the techniques and methods I have used to make Windows 8.1 adapt to my way of working and to work very much like Windows 7. Windows 7 commands the biggest percentage of windows operating systems and I have used it. I took the next step to Windows 8.1 and I have it working smoothly. You can too.